Ancestral history of Gary and Deborah Davis from Deerfield Beach, FL USA. Features database and pedigree reports for Gary Alan Davis, Nachman Gross and Schlomo Meisner. Database software which shows family tree relationships by century, focusing upon any one family member. Provides tips on how to research family history online and how to build a family tree. How to make a tree to remind us of Jesus family tree. Includes line drawing symbols and Bible readings. Family tree of Lorraine Williams of Australia including the surnames Walters, Gilham, Rawlinson and Spanswick. Provides simple and easy way of building your family tree online. Find your ancestors,research your family tree. Genealogy software accessible by the internet only which will create an online family tree. Family tree and photographs compiled by Cyril Davies. Contains over 3000 Overhof(f)s/Oberhof(f)s from all over the world (mainly USA, Germany, Austria and the Netherlands). Some branches of the family-tree date from before 1600 until now. Family tree shareware which features multi-page tree printouts. Support for discontinued Ultimate Family Tree software. Family tree from circa 1700s from Brampton Abbotts, Herefordshire, ENG to current day AUS. Researching the line from England, UK. Provides information about the name, a family chronicle, family tree and photographs. Family tree of Bob Gannon, including surnames Alcock, Scott and Waugh. Features Scottish cland and events, coat of arms and Pennsylvania and Philadelphia links. Scott, Waugh, Holmes, Morgan, Alcox, Ireland, Scotland, Wales, Scottish Clans, and whisky. Eventually some information about my family tree will be available. Genealogy researcher for family history albums. Offers free and unlimited genealogical research to create customized family history albums and family tree print designs. Genealogy researcher for family history albums. Offers genealogical research to create customized family history albums and family tree print designs. Worldwide family tree of Michael John Kearvell from Wantage, Oxon ENG. Study is indebted to Gordon Kearvell (ENG) and Mary Voyle nee Kearvell (NZ), who compiled the original tree. Family history of Mark Wingfield of Sheffield, UK. Features family tree, photographs, surname list, and contact information. Part of the Kumbanattu Kudumbayogam family assembly. Includes a family tree, photos, and memories and reflections of T.J. Thomas Theckethil Kumbanad. Pedigree database featuring the family of Veronica Silverthorn. Family resources and documents. Includes link to Rootsweb family tree. Contains short stories, drawings, family history, photos and family tree. Windows-based genealogy software to create family trees. Researching the family lines across NC, GA, TN, AL and TX, USA. Family tree of Cindy Chappel including photographs. General history, photographs, associated links, gedcom files and family tree. Richard Sullivans family tree including name index and guestbook. Family Tree including resources on , Wright, Savill, Stein and Murrell family names. Popular full-featured family history software available for free by download. Leicester and Derbyshire family including the branches of Baldock, Milum and Slade. Family history including surnames Lebrun, Smithwick and Graham, mostly Australia. If the business hours of Davis Family Tree in may vary on holidays like Valentine’s Day, Washington’s Birthday, St. Patrick’s Day, Easter, Easter eve and Mother’s day. We display standard opening hours and price ranges in our profile site. We recommend to check out familytreemaker.genealogy.com/users/d/a/v/Gary-A-Davis/ for further information. 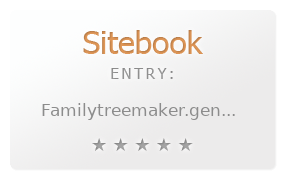 You can also search for Alternatives for familytreemaker.genealogy.com/users/d/a/v/Gary-A-Davis/ on our Review Site Sitebook.org All trademarks are the property of their respective owners. If we should delete this entry, please send us a short E-Mail.